Odds are, you’ve seen the milkshakes at Black Tap in your Insta feed already: Towering, over-the-top creations finished off with piles of candy, generous drizzles of caramel, or, in one case, an actual slice of cake. Catherine McCord of Weelicious, in partnership with Undeniably Dairy, dared to give the give Black Tap’s star menu items a healthy spin. “Black Tap is renowned for its shakes but this time of year is all about health and wellness,” says McCord, alluding to the fact that the flu is, well, everywhere. 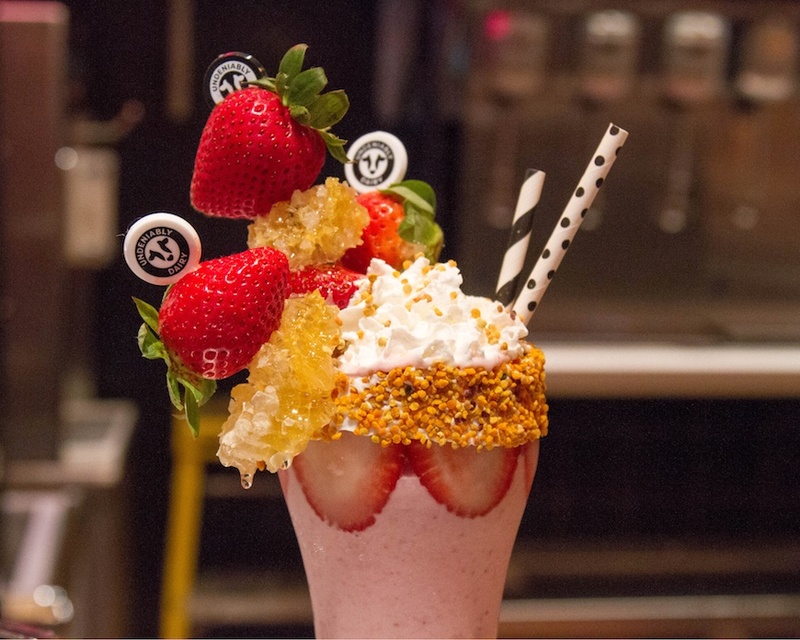 The result: A collection of equally Instagrammable smoothies that launched at Black Tap’s Lower East Side location this week and will be available for one week only. To celebrate, McCord shared her recipe for the Berry Dairy Delicious smoothie exclusively with Well+Good. Inspired by Black Tap’s Cotton Candy Crazy Shake, the Berry Dairy smoothie gets its pink hue from frozen strawberries, richness from a blend of milk and yogurt, and jaw-dropping surprise factor from the addition of frozen cauliflower. After you whip one up, the next step is, of course, to Instagram it. “It’s all about the lighting and food styling,” says McCord, who rims the glass with immunity-boosting bee pollen and tops the smoothie with skewers of whole strawberries and honeycomb. “Set the smoothie in natural light and play with angles, shooting all the way around the glass,” McCord advises. “The most memorable images are the most unique ones. Keep reading to get the over-the-top healthy smoothie recipe. 1. Place strawberries, cauliflower, milk, yogurt and honey into a blender and puree until smooth. 2. Pour smoothie into a glass and top with fresh strawberries, honeycomb, and bee pollen.